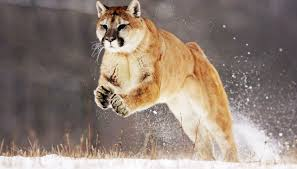 The mountain lion, also known as the cougar, puma, catamount, and panther, is a solitary, ambush type hunter, that ranges from the Yukon in Canada, and the western United States, down into Central and South America, as far south as the Andes Mountains! They once ranged the entire U.S., as many animals did, but very few if any are found in the eastern part of the country now. An exception is, the Florida panther. Some mountain lions have been making a comeback in the northern U.S., moving east, and have been found in Wisconsin and Minnesota. These cats are also huge and fast. The weigh almost a 150 lbs., and can run 40-50 mph! They stalk their prey, like your cat at home does, chasing a mouse. Before you know it – they attack! They are in fact more closely related to the ordinary house cat, than they are the lions of Africa. If you look closely they do look similar to house cats, but these cats don’t play! As far as food is concerned they primarily go for large game, but are very adaptable, and will eat smaller animals, even rodents. When I say large game, I mean deer, bighorn sheep, elk and even moose! 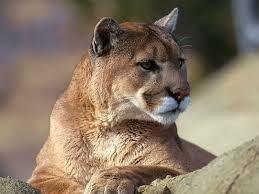 There must be tremendous power in the mountain lion in order to bring down, an animal as big as an elk or moose. Have you ever seen an elk? Talk about large! They can weigh as much as 1,000 lbs. It’s no wonder that elk were sought after by First Nations people, they meant a lot of food for hungry families. Moose are also huge animals, and are the largest species in the deer family. 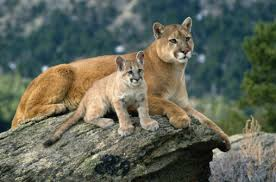 I have included a short video of mountain lions. There is no hunting in this segment and no other animals are hurt, it is simply photography of this magnificent animal! I learned a lot by reading this post. Thank you for sharing. I love this one, thanks for sharing this. Thanks Maria! They are amazing. Blessings to you. What an amazing animal, and what a wonderful tribute you’ve given to it! As always, your posts inspire & remind us of the good things in this world. I am sorry for my lack of comments these weeks. It’s been a hectic time. But, I have been reading and enjoying your posts 🙂 Best wishes to you and your family! Takami thank you so much! Your presence here is a tremendous blessing. We all get busy so no worries. Blessings to you and yours! Thank you for your comments! Peace to you.